Parmesan roast pork is a well-seasoned, quick and easy main dish recipe. Keep the ingredients on hand for a fast last-minute dinner. Make sure you have a center cut boneless roast no larger than 2 pounds. The bone-in or tied types take much longer to cook. 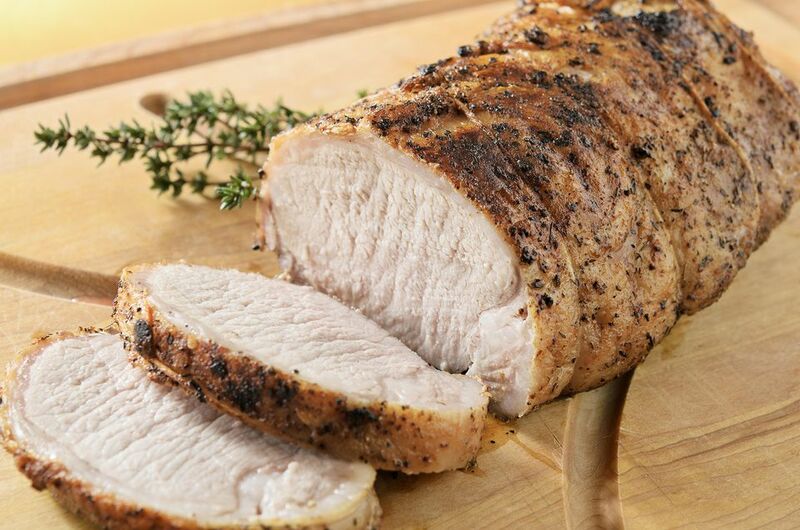 Make sure that you are buying a pork loin roast for this recipe, not a pork tenderloin. The tenderloin is a much smaller cut of meat and cooks much more quickly. The two are not interchangeable in recipes. This simple treatment can be used for a beef tenderloin too. You can vary the type of cheese you use; Romano would be a nice substitute. Or use a different type of dried herb. Basil or oregano would be good choices. Serve this roast with some scalloped potatoes or mashed potatoes, some green beans or asparagus, and dinner rolls or scones. For dessert, a nice simple chocolate cake or some brownies would be a delicious finish. To roast the pork: Preheat the oven to 375 F.
In a small bowl, combine the olive oil, thyme, chicken broth, salt, and pepper. Roll pork in this mixture, then roll in both types of the Parmesan cheese to coat. Place the pork on a roasting pan and sprinkle with any remaining cheese. Roast, uncovered, for 40 to 50 minutes until an internal meat thermometer registers at least 145 F.